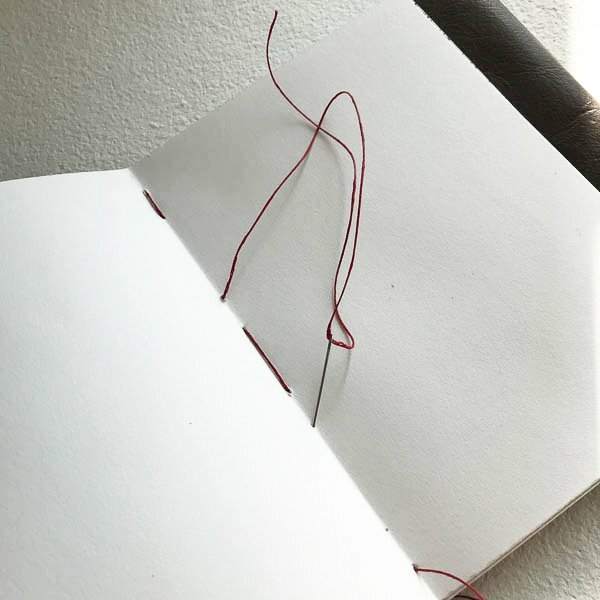 One of the first books I made in my 50 Book Project was a Long Stitch Binding with Packing. The packing refers to one thread being wrapped by another. There was a tutorial by Dennis Yuen but his blog is no longer active and I’ve never seen the instructions elsewhere online or in a book. So I thought I would make a quick tutorial on how to make this stitch. 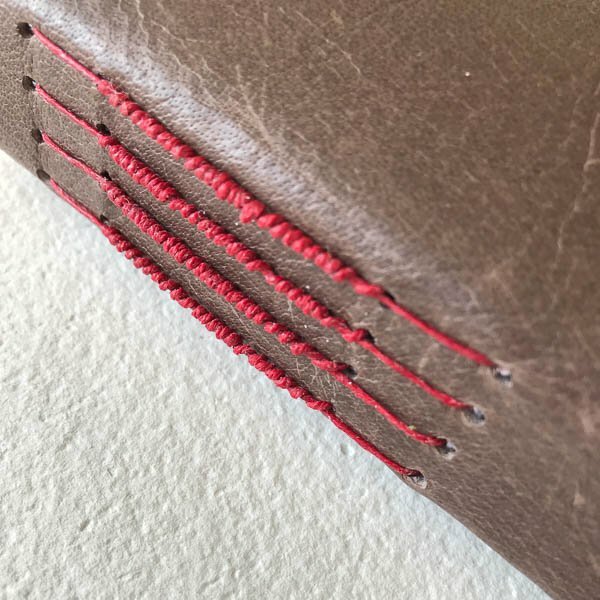 Create a book cover from thick paper or leather and a minimum of four signatures. My signatures measure 7″ high x 5″ wide and the piece of leather is 7.25″ high x 14″ wide. 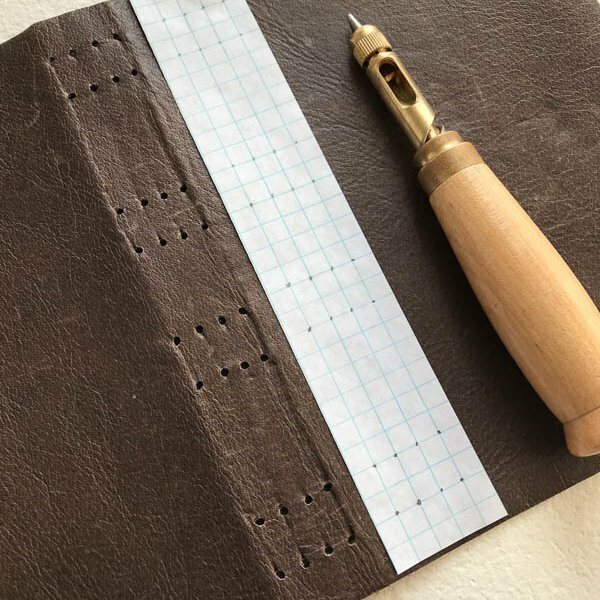 Create a sewing template using ¼” graph paper. 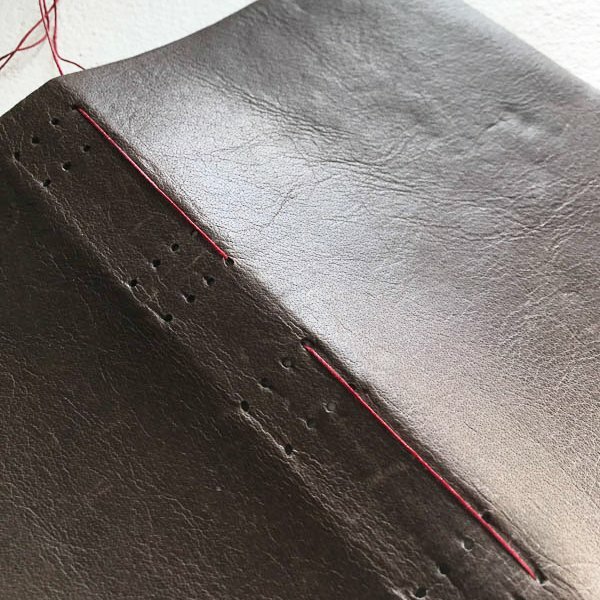 For each signature you plan to sew onto the spine, create one row containing 8 sewing holes. In this book the holes are marked at 0.5″, 1″, 2.5″, 3″, 4″, 4.5″, 6″ and 6.5″. 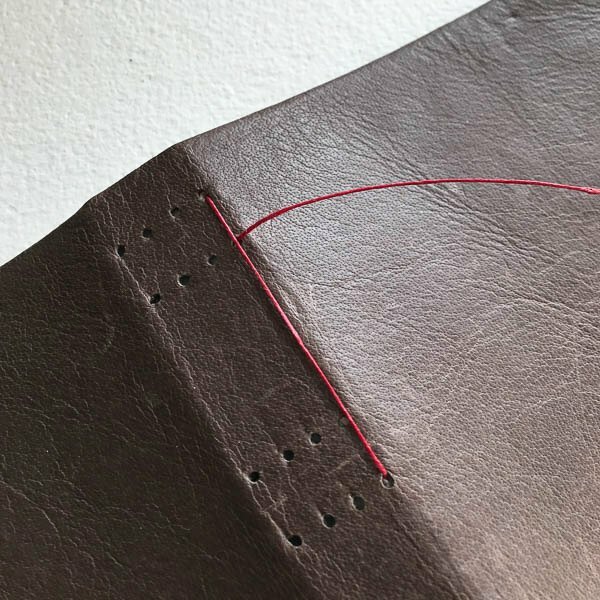 Create your sewing holes on the cover with a Japanese hole punch. 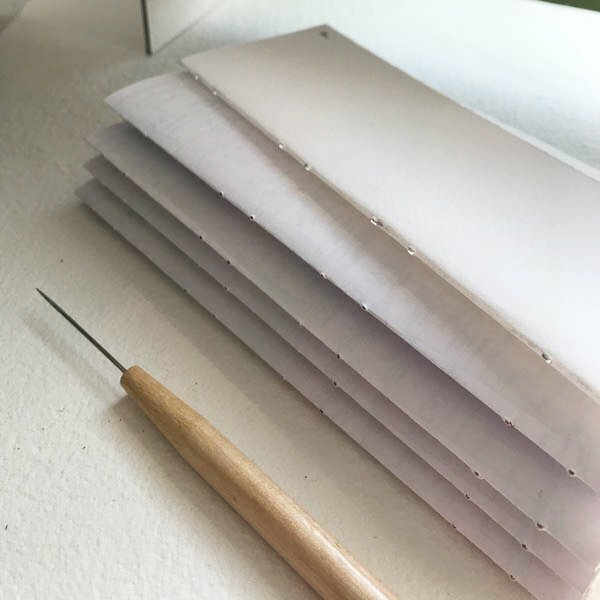 Fold this punching template in half and use it as a guide to make the sewing holes in your signatures. Tip: to make sure the holes are properly aligned, make a small pencil mark at the head of the template, the cover and all the signatures. Enter sewing hole 5 from outside to inside (yes, you’re skipping holes 6 & 7). Exit sewing hole 4 from inside to outside. Enter sewing hole 1 from outside to inside (skipping holes 2 & 3). 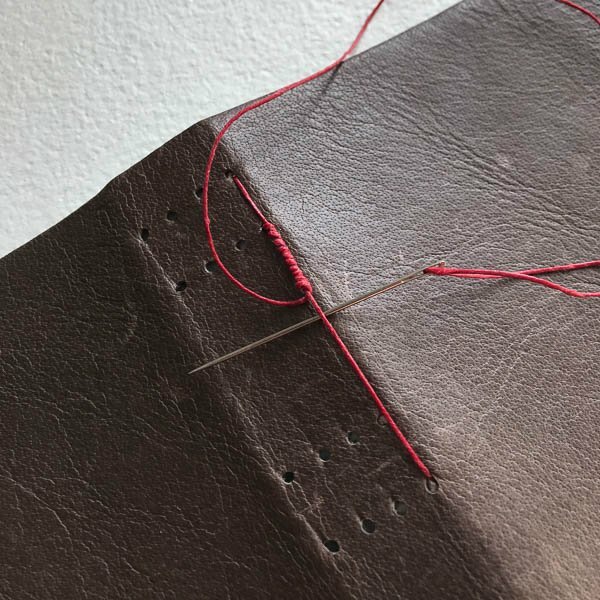 Now for the packing, exit hole 2 from inside the outside and wrap the thread around the long stitch created in previous step until you reach hole 3 and then enter the cover/signature through hole 3 outside to inside. Tip: Make sure your packing or wrapping goes in the same direction (either clockwise or anti-clockwise) and hold the long stitch taut on the inside to make the packing easier. 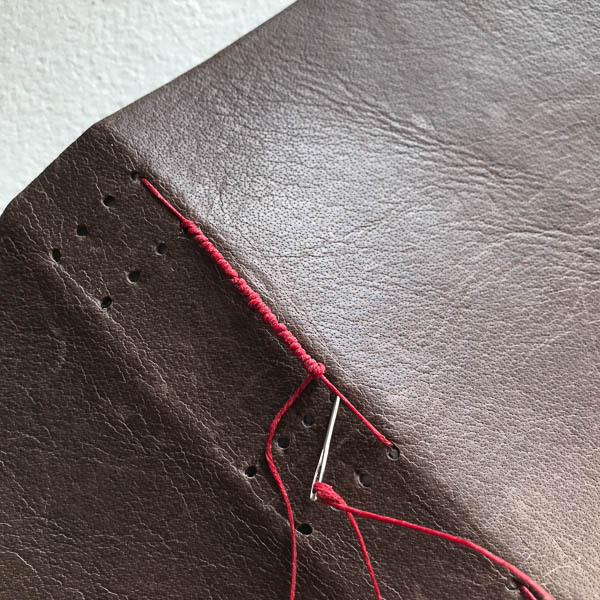 Repeat the same process with the lower four holes and tie off the thread inside the book. Repeat this sewing pattern for the remaining signatures. Finish the cover as desired. 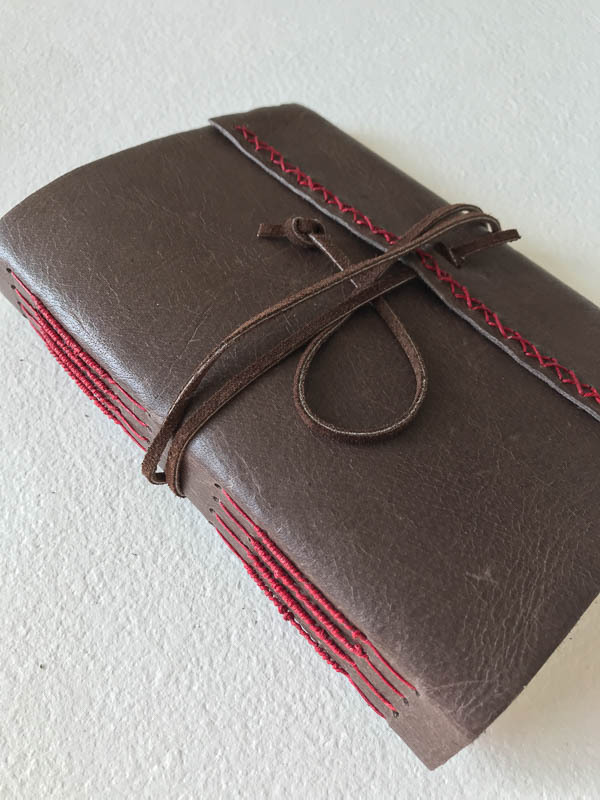 Thanks for sharing such a unique binding! Lightbulb moment! You’ve taken the mystery out of this binding. Never occurred to me that the wrapping would happen through their own holes. Brilliant! Grata por compartilhar 🙂 !!! Thanks so much. It is so nice of you to share this. Thanks so much. The directions with pictures are most helpful. About how thick are the signatures if using 1/4″ graph paper? I look forward to trying this. Instructions look easy and thank you for sharing. What an amazing book. 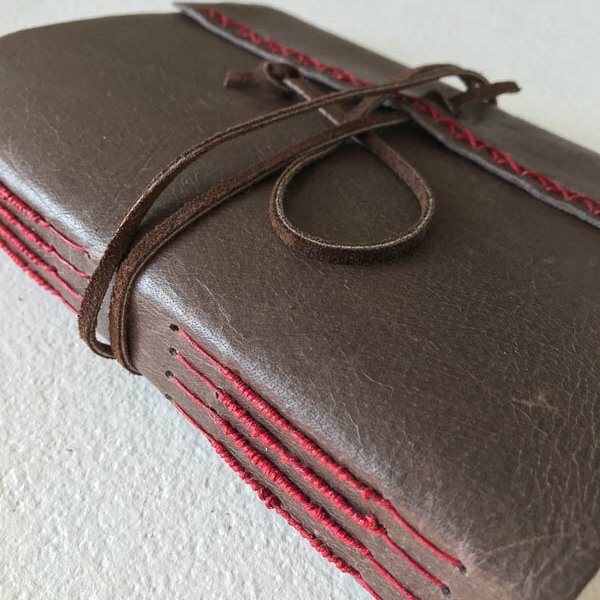 I am approaching my first hand made journal. More accurately, i’m sneaking up on it in a way that i hope is discrete. I have an image in my mind and yesterday i cut two boards from packing material. 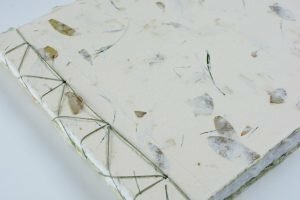 I plan to bind visual journals and would like a format that will expand to accommodate the layers of paint and collage material. Honestly, Ali, I feel like my goal is attainable since i’ve joined the FB group and been receiving your posts in my inbox. Thank you so much. Hi Tree, thanks for your kind words. 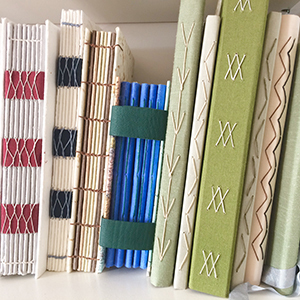 I’m so glad you’re encouraged to make handmade books since you joined the FB group. I can’t wait to see what you make! Excellent instructions and very easy to follow. Thank you for sharing. I’m so thrilled to have found your website. I purchased the August paper club paper and it is so beautiful!! I’m in the process of making the concertina. Can’t wait to start on the above book. I know just who I’ll give it to. Thanks for sharing. Ali, thank you for this tutorial. I have two questions please: 1) on the inside, how much of a gap is there on the spine between signatures. 2) if you wanted to make this book using book board instead of leather, how far apart should you space the front and back cover board from the center board formthe spine when covering the board? Thanks! Using a Japanese screw punch was a lifesaver. Perfect little holes, easy to sew through. I used the 1 mm punch and the holes were 2 1/2 mm apart.